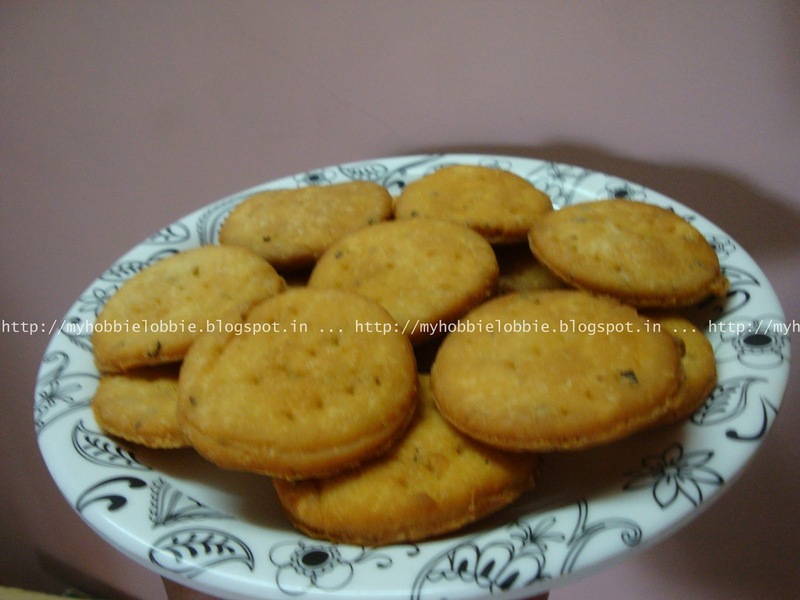 I was looking at putting together something savory for a tea time treat and I thought of this Indian version of the cracker that one of my Mother's neighbors had made many years ago while we watched on. I don't really remember the recipe she used. All I remember her saying is to make sure that the oil used in the dough needed to be warm. So with that in mind I just put a few things together and tried it out and it wasn't too bad. Turns out we really enjoyed these crackers. The traditional version is called Mathri and is deep fried, though I'm sure they'd bake well too. Mix the flour, salt, pepper and carom seeds in a bowl. Add the warm oil and mix well to incorporate into the flour evenly. Add warm water gradually to knead into a dough. You may not need all the water. The dough shouldn't be too soft or too hard either. Roll out into thick-ish discs and use a round cookie cutter and cut out into smaller circles. Prick each circle a couple of times with a fork to ensure that it doesn't puff up while frying. Repeat till all the dough is used up. Heat oil in wok for deep frying. Carefully fry a few crackers at a time on medium low flame till they turn golden brown. Let them cool off completely before storing in an air-tight container. Enjoy them with your afternoon cup of tea. I just love to snack on Crackers and your recipe looks great. I would love these Crackers! Hope you are having a great week end and thank you so much for sharing with Full Plate Thursday.